There are some days when I just do not know what I'm going to write about. It's kind of a weird thought that blogging only accounts for about 5% of what I do on a daily basis. More often than not, I come up with a blog post idea and think, "That's it, Carly.... the well's dried up. Nothing left. This is the end!!!" And then something else comes to me the next day. I've always kept a running list of blog ideas. In college, it was in a notebook by my bed and now it's just on my iPhone. 1. Somewhere you've always wanted to travel to 2. Your favorite book/show/movie growing up 3. The best piece of advice you've been given 4. A hard choice you had to make 5. What's your favorite trick/hack that your mom taught you 6. If you had to choose one outfit to wear for the rest of your life what would it be 7. Share your bucket list 8. Post five pictures from childhood and tell the stories behind them 9. Write a letter to your future self 10. Give yourself a challenge and document the process 11. List 10 weird facts about yourself and ask your readers to do the same thing 12. A day in the life 13. Share an article or book that really made you think or changed your mind about something. 14. Ask your readers to help answer a question for you ("What's your favorite easy recipe?") 15. Do a Q&A with someone you admire 16. Make a list of your favorite books 17. Wear one piece of clothing five different ways for a Monday-Friday post 18. Review your "can't live without" beauty products 19. Put together the ultimate wish list 20. Swap your blog with a friend for the day 21. Explain a tip or trick that you use every day 22. Try something new... Like a video blog! 23. Post three things that are currently inspiring you 24. Write a public thank you note to someone you know 25. Put together funny/embarrassing photos that you otherwise wouldn't share 26. Share your favorite artists with your readers 27. List your favorite family traditions 28. Do a collage of a color combination that you currently love 29. Tell your readers a secret you've never shared online before 30. Test a few recipes or crafts from Pinterest and share the results 31. Share the most-worn thing in your closet 32. Embed the cutest viral videos you've watched 33. Find and share 10 cute things under $10 34. Tell a story that's been passed down through your family over the years 35. List your favorite restaurants and to-dos in your city 36. Explain why something was the best or worst "splurge" 37. 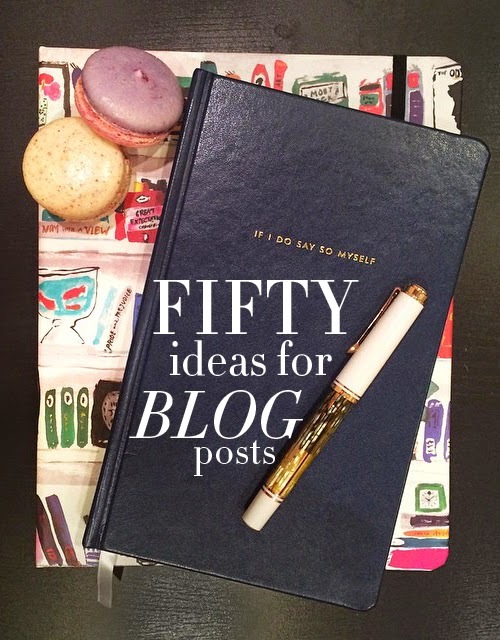 Do a roundup of your favorite bloggers or Instagrammers 38. Share the last five things you've purchased 39. Post a tutorial on how you do your everyday makeup 40. List out your nightly or morning routine 41. What do you keep on your bedside table 42. Favorite drug store buys 43. What advice would you give your 16 year old self? 44. Put together a mood board/collage 45. Do a "how to" post 46. Share your earliest or favorite memory 47. Post an easy-to-wear, but chic outfit 48. List your favorite quotations 49. 10 things you learned from .... (college, running, moving across the country, etc.) 50. The story of why you started your blog! Any other great blog post ideas? How do you keep track of your ideas?